This week I had my friend Jane over to try some Wildtree favorites. Jane is actually responsible for getting me on the organic bandwagon over two years ago. She is much better than I am with her clean eating (I am a work in progress! ), so I wanted her knowledgeable opinion about the products. 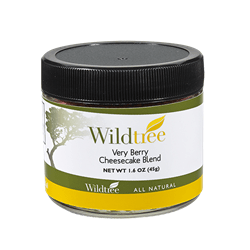 I was thrilled to get much positive feedback about the quality of the ingredients and the taste, and after an enjoyable time eating healthy veggie burgers and organic rice, I am afraid I did get her to eat this Very Berry Cheesecake. She pointed out that if I used organic cream and made the whipped cream myself, it really would be a clean dessert as long as you don’t have an issue with dairy. She did, however, eat the whole thing! Combine all of the ingredients except the berries. Put in serving containers. Top with fruit and chill. If I am preparing this for a large group, I use small dishes and I use a frosting bag to pipe the cheesecakes into the little containers – it looks pretty, and you can make a little go a long way! Pictured below is some I made for a party – you can use disposable shot cups with covers for easy transport and easy cleanup!